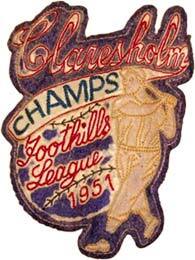 1951 Foothills Baseball League champion Claresholm Meteors. Left to right (back row) - Hubert Glenn, Lefty Huddle, Ward MacDonald, Bernie Dunning, Al MacDonald, Jay Jenkins, Glen Olson. Front row - William Kennedy (coach), Davie Davison, Jim Powers, Boyd Whitehead, Dutch Dodd, Adam Linton (manager), Donnie Whitehead (mascot). Thanks to Joe Dunning, whose dad Bernie played for the powerful Claresholm Meteors in 1951, for a scan of the crest on Bernie's baseball jacket. 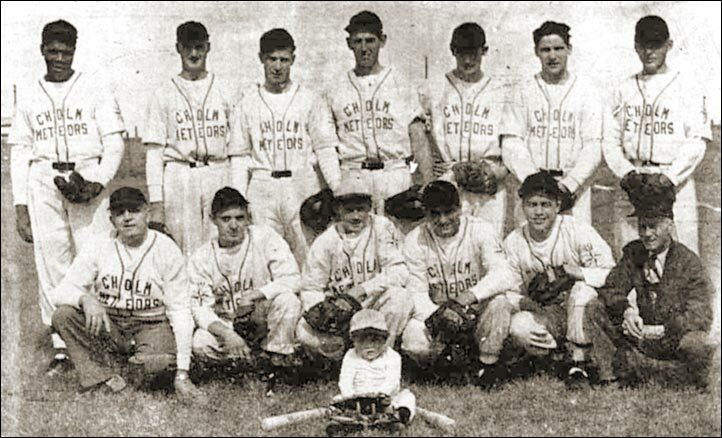 The team photo was carried on the front page of the Claresholm Local Press, October 4, 1951.